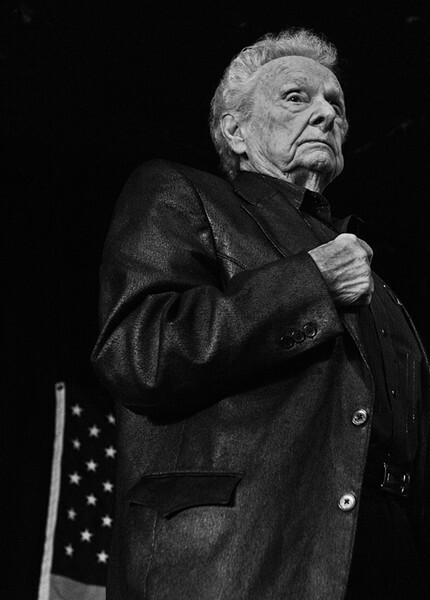 Last time I spoke with Ralph Stanley, he was signing a photo for me that I gave to some friends in California. This was during a benefit concert at the Canal Club that Stanley played for Senator Mark Warner years back, during which Warner danced a jig onstage. Stanley was elderly but still sharp in person and a mesmerizing presence onstage. His voice high and clear, certain like a weathered stone. One of the founders of bluegrass and one of the last of the true old-time mountain musician greats of Virginia, he died today (June 23) of complications from skin cancer at the age of 89. He was born in Big Spraddle, Virginia and died at his home in Sandy Ridge, Virginia. We wrote a brief preview when Stanley performed at the 2012 Richmond Folk Fest, during which he wowed huge crowds, escorted to and from the stage by a golf kart to adoring applause. For more insight on his legacy, check out this piece by Charles McGrath for the New York Times in 2009. You can also learn more at the Ralph Stanley Museum in Clintwood, Va.
Another true legend of music has passed. Thanks to the Coen Brothers for reintroducing his music to the masses in their 2008 film, "O' Brother Where Are Thou?" Here is Stanley at the Richmond Folk Fest.